The Big Wobble: Another massive coronal hole has opened up on our Sun and is facing Earth! Chance of major quakes in the coming days! Another massive coronal hole has opened up on our Sun and is facing Earth! Chance of major quakes in the coming days! Another huge coronal hole has opened up on our Sun and is facing Earth and is spewing streams of solar wind towards Earth at an incredible 750 kilometers per second. 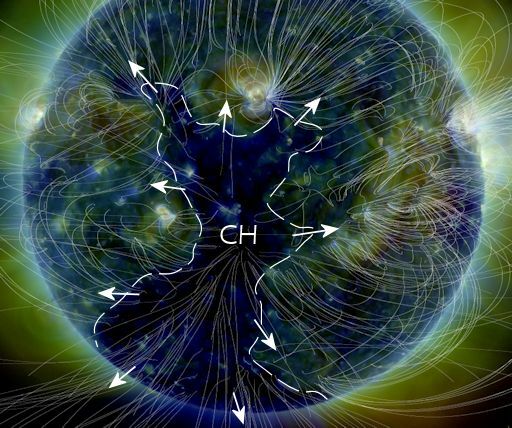 It’s another massive hole in the Sun’s atmosphere and could influence major quake activity here on Earth in the coming days. The whole is so huge it stretches more than halfway across the face of the Sun. 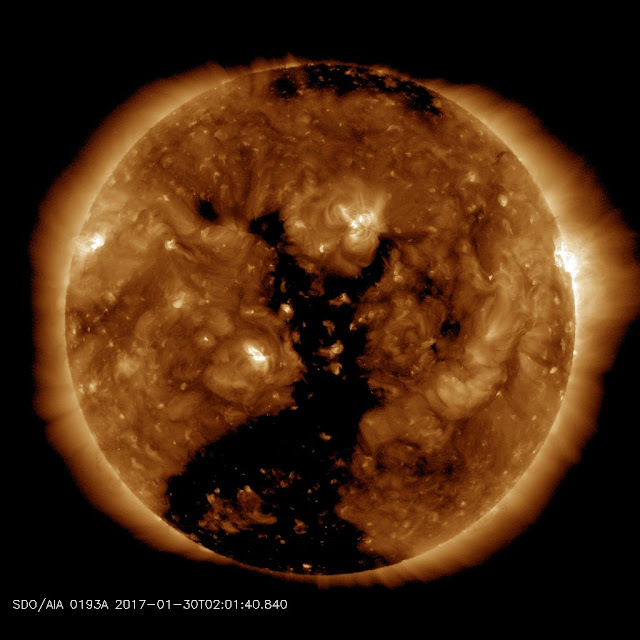 Spaceweather reports: This is a "coronal hole" (CH)--a region where the sun's magnetic field opens up and allows solar wind to escape. NASA's STEREO spacecraft recently sampled the stream flowing from this hole and the velocity was unusually high: 750 km/s. Such a fast-moving stream will almost surely spark Arctic auroras when it arrives on Feb. 1st. This is interesting. Last night Feb 1st, my dog began howling which he never has done before and an air purifier and a radio turned on by themselves, between 2:00 & 3:00 AM. When I arrived at work a co-worker told me a very similar story of his dog and a radio and intercom system. Google earth GPS has been way off for several days now.